I painted this one a while ago but have only just got around to getting it framed. 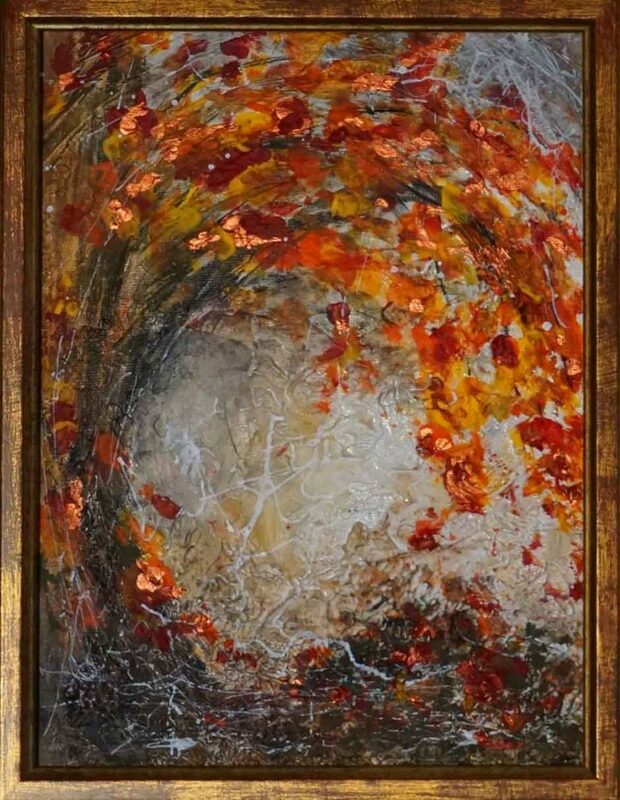 Being quite textured acrylic it was just attracting dust so here it is framed. I was using a tutorial I found on youtube by Peter Dranitsin and I really enjoyed painting it. Oh I must do more painting soon – where does my time disappear to? I have finally finished knitting my long leg warmers and I can’t say it was a labour of love but just necessity. 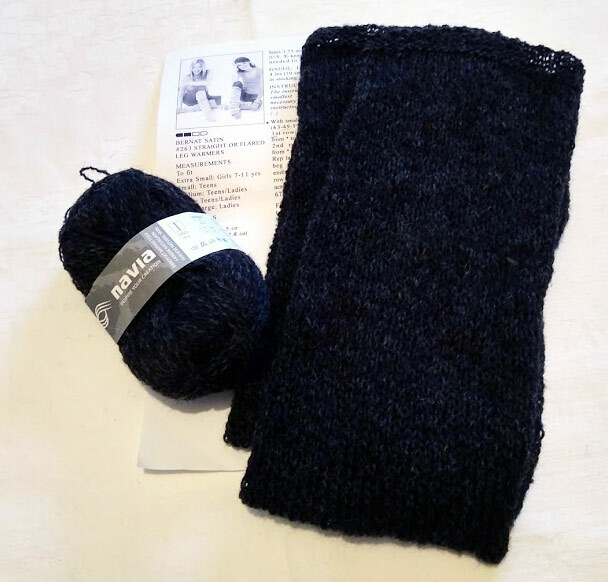 I was so very annoyed at having lost my one and only fabulous pair of Calvin Klein, long black leg warmers, and have been unable to find anything similar, so I just had to bite the bullet and make some. 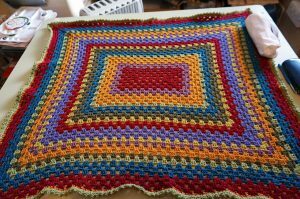 I did try to knit in the round with the 4 short needles, but, with my arthritic hands, I just kept losing my grip on the needles and the stitches all fell off. So they are just a long rectangle with a small cuff at the bottom and and top, then cast off using Lori’s stretchy bind off. Then I stitched up the seam. 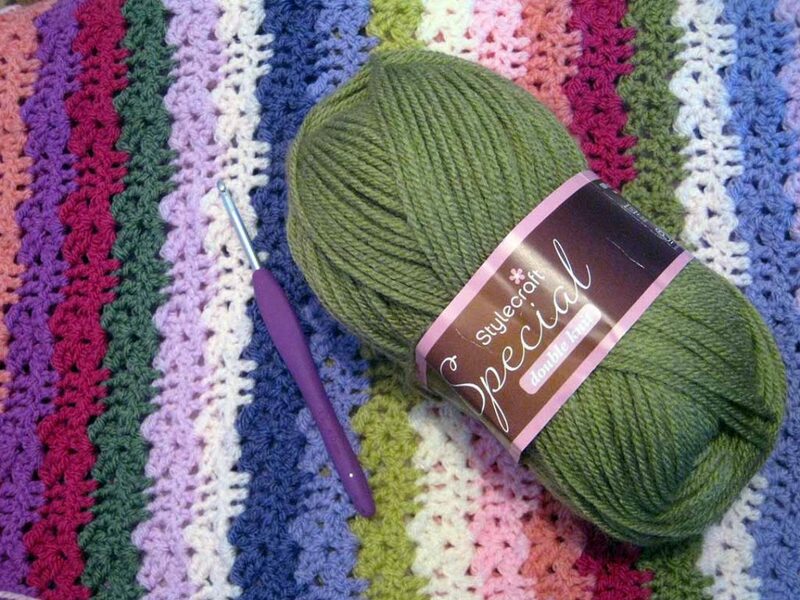 I am not a big fan of that yarn either as it kept breaking leaving a thread with a bit of wool missing. 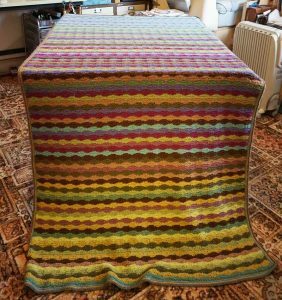 Now I can put my knitting away and get out my next crochet project. 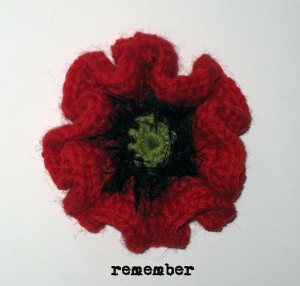 I much prefer crochet as it is a lot easier to see and sort out mistakes than knitting is. 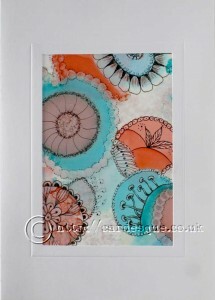 I have been having a go at a tutorial in Paint magazine by Sue Williams of a pen and wash scene. 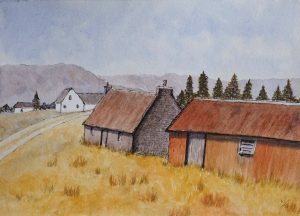 The camera hasn’t picked up the colour all that well, but having said that I could have added a bit more colour in the grassy areas. I am not sure whether I should keep going with it and add more colour to the foreground or just leave it be? I think I will leave it for now and I can always go back to it if I want to later. My goodness how did it get to 2018 so quickly! My mojo went for a wander so I just had a wee break from anything arty/crafty for a while but I am back now to have another go. So I am starting the year off by doing small sketches or other in my sketch books or art journals rather than trying to paint ‘proper’ pictures so that I don’t mind too much if I muck up. 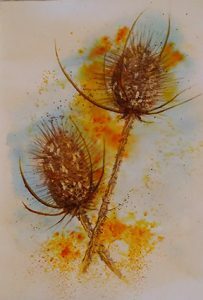 I did this the other day having watched Alison C Board’s video on you tube painting teasel on wood. My version is not on wood and doesn’t use the same colours but it gave me inspiration to have a go. Watercolour and Brusho but with a bit of Stabilo pen to darken a few lines. 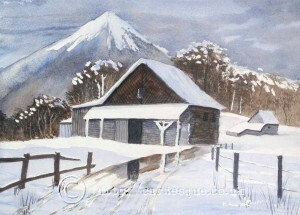 Here is my latest painting from Terry Harrison’s tutorials. 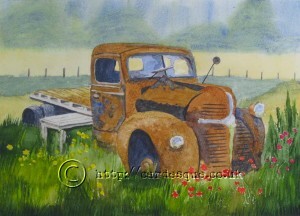 This one is of a 1952 Dodge that he spotted on his travels. In real life (his photo) it doesn’t look as rusty as this but he shoes how to get a rusty looking effect.